It's the last day of 2012. At my age, that tends to trigger "Where the hell did that year just go?" sort of thoughts. In hindsight, 2012 has been a full on year. My workload at the Uni has been ridiculously heavy and relentless. Just for example, this year I have had to cope with the changeover to a new Leaning Management System, new editions of text books at the last minute, new chief examiners based overseas in different timezones, been caught in the middle of a few nasty cross faculty political battles and new and baffling forms of adminis-trivial torture. At times, work has all but taken over everything with marking even encroaching on my me-time! The students more than make up for it all though. I love the face to face part of teaching! I love the bright new faces each semester, some of whom go on to be friends throughout their time at University. I love to see them mastering useful skills and going on to use them productively in the degree and work life. My wish for 2013 is that the New Year's Fairy, (there is one of those isn't there?) gifts me with awesome time management skills and makes me a multi-tasking wizard so I can be totally productive when I am at work and stop being distracted by anything else shiny that looks more fun and get more done actually at work. I've still managed to be productive and creative in bursts in 2012 though. Here's a retrospective look through 2012 as seen on the blog. 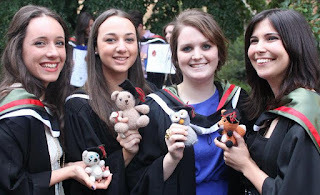 In January, we met a Menagerie of Gradu-animals, gifts for my eldest daughter and her friends for graduating from University. February saw the start of the Granny wants a Latte Macchiato granny rug. It's about one third finished at the end of year. I keep getting distracted by other bright shiny things. I also blogged about the UFOs and PHDs (Unfinished Objects and Projects Half Done) that I had excavated from their nooks, crannies and other hiding places. The really sad fact is that it now the end of 2012 and I haven't finished any of these! In March we had Part II of the PHDs and UFOs. All I really need to do is knuckle down and finish these. In most cases, I just have to sew things up. Believe it or not this is a camel! In April, I updated the progress on the Granny wants a Latte Macchiato granny rug. I reminisced about my first forays into making socks and knitting in the round and I made a little Kimono dolly for a work colleague. I really want to make more of these! There was no blogging at all in May and June. These are traditionally mad work months anyway with masses of marking and the run up to exams. And we had a very unexpected death in the family. Let's just write those months off, OK? In July I finished off a post I started in May. The winter chill made me think of scarves so I blogged about a few hand knit scarves I had made my girls and their overseas journeys. We were also in the midst of renovating with our lounge room in the dinning room and the dinning room table in the middle of the shed. In August I made Sharkie the beret as a 21st present for Tammy who loves sharks. I also made the Owlishly warm fingerless gloves; two pairs of them, one for me and one for the middle daughter Mel. These were such fun to make. In September I finished Spirali the scarf, one of those helix, spiral scarves that seem to be everywhere at the moment. I whiled away the time watching the Olympic games pushing my knitting boundaries and producing the Tribute Socks. These would be the knitted objects I am most proud of this year. The new lounge room got to be the backdrop to this month's photos too. No posts in October. Marking again! In November I added another installment to the Beret Project, Winter Smoke: the Selbu Modern Beret. I also finally got to blog about a present I made for an Italian exchange student who stayed with us a few years ago after a complicated cross-continental handover was successful. So the Giulia doll finally got her story told. In December I posted 27 times, one post for every letter for the A month of A to Z challenge from Just B (actually there were two posts for T). This is more posts than I had done in the whole eighteen months I have had a blog! It was challenging and great fun and I made so many cool new creative friends along the way. Just a few of these were specifically me being creative so I'll highlight those here. M was for making things for Christmas - recycled magazine present bows, a whole weekend of good clean Christmassy fun for my eldest daughter and the rest of us. P was for Playing in the Park taking Photographs, the story a photoshoot of random stuffed cats. T was for Tapestry, a trip down memory lane to when my parents were young. W was for Wall, a wall of clipboards to control the out of control paperwork monster. And X was for Christmas Owls. I made an owl ornament for my sister. It was a good year all in all. I am thankful.